Global Ice Center Report on the Northern Sea Route in 2014 Ice experts review the opening period of the NSR for the fifth year in a row! – Weathernews Inc. Global Ice Center Report on the Northern Sea Route in 2014 Ice experts review the opening period of the NSR for the fifth year in a row! 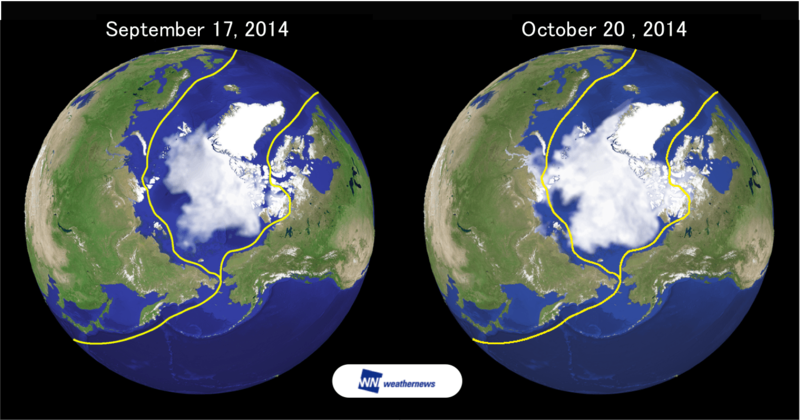 Following the closing of the Northeastern Passage of the Northern Sea Route (NSR) on October 1st, the Global Ice Center at Weathernews Inc.（HQ: Tokyo, Japan; CEO: Chihito Kusabiraki ) looks back at the opening period this year. Ice in the Arctic Sea continues on a trend of recession since the turn of the century. For the fifth year in a row, Russia’s Northeastern passage fully opened from late August, staying open for six-weeks. This summer saw a record number of applications for permission to sail the NSR. Meanwhile, ice remaining in the Canadian archipelago prevented the Northwestern passage from becoming transitable for the first time in five years. The lowest area of ice observed by the Global Ice Center (GIC) at Weathernews this summer was 4.8 million km2, which is the sixth smallest area in recorded history. (fig. 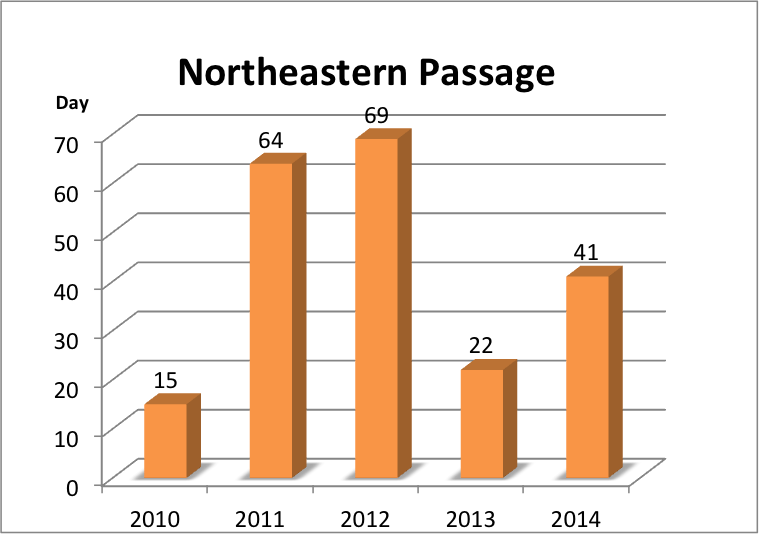 1) Different trends can be seen when comparing the Northeastern and Northwestern passages in the summer of 2014. Ice in the Northeastern passage began to melt from late May, opening fully from August 21st to October 1st. However on the Canadian side, the Northwestern passage was partially blocked by ice, thus preventing use by commercial vessels. This is the first time in five years that the Northwestern passage did not fully open. According to Dr. Genki Sagawa of the Global Ice Center, a specialist in polar science, lower temperatures and few low-pressure systems that help ice to break up are the causes for limited melting this year. Russia’s Northern Sea Route Administration (NSRA) received over six-hundred applications for permission to transit the Northeastern passage this year, the most they’ve ever seen until now. This indicates the global shipping industry’s expectations for higher profit margins by exploiting the fuel and charter cost savings on shorter NSR voyages. Figure 1: Comparison of lowest recorded ice extent of 2014 and current conditions. 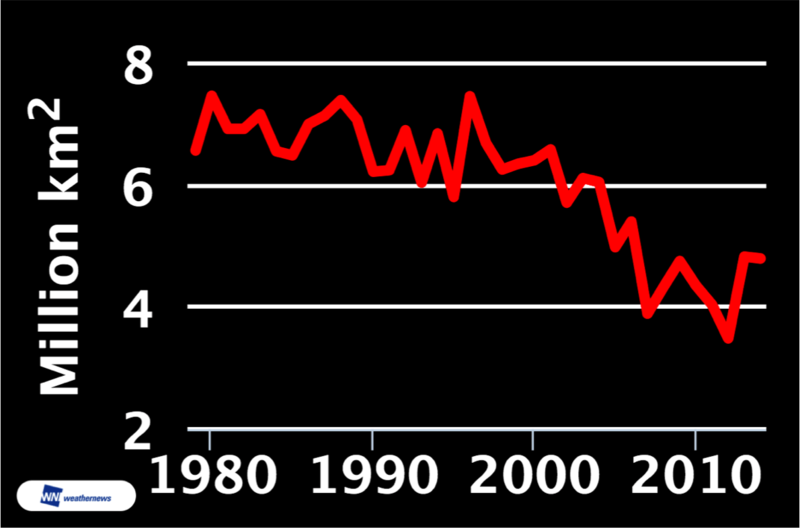 Figure 2: Minimum Arctic ice extent 1980~2014. The possibility of commercial use of the NSR emerged in 2005 when the passage opened fully for the first time. Four years later, the first commercial voyages through the NSR sailed in 2009. Although ice extent followed a trend of recession until reaching the lowest ice coverage ever observed for more than two months in 2012, the following year saw a shorter opening period at a little more than three weeks. (fig. 2) “The number of days the NSR stays open can vary greatly from year to year, so the GIC has been keeping a close watch on Arctic ice trends,” said Sagawa. (fig. 3) Dr. Sagawa also explained that, “Even after the opening closes, it has still been possible in recent years to transit the route with ice-breaker escorts until about November. Since a lot of ice starts to appear along the route about this time, finely detailed information concerning sea ice and weather conditions become critical in order to safely sail the NSR.” To support vessels challenging this route, the Voyage Planning Group at Weathernews provides Polar Routeing Service. Figure 3: Number of days the NSR has stayed fully open over the past five years. In recent years, the shipping industry has accepted the need for reducing operating costs by sailing the NSR, so the Voyage Planning Team at Weathernews started providing Polar Routeing Service from 2011 to meet the industry need for better information to minimize risk and optimize scheduling. The main service provides weather conditions through briefings given by Risk Communicators from the Voyage Planning Team. In additional, Weathernews provides information on the concentration and distribution of sea ice analyzed by the Global Ice Center to help ensure a safe and efficient voyage. The company plans enhance their service for NSR voyages using proprietary satellite observations infrastructure with launch of WNISAT-1R in 2015.